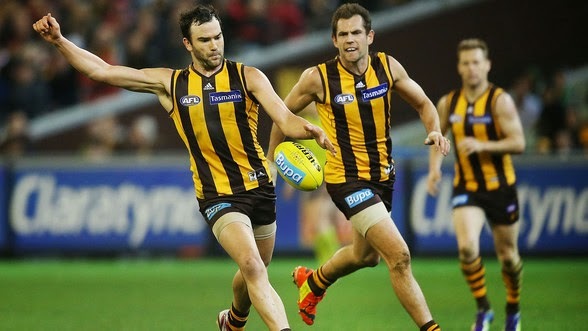 Hawthorn spearhead Jarryd Roughead has returned to the Hawks' line-up following his skin cancer scare. Roughead underwent surgery to remove a melanoma from his bottom lip in the week leading up to Hawthorn's round 14 clash against Collingwood. The 28-year-old sat out two matches before receiving the all-clear and comes back into the side to face Sydney at the Olympic stadium on Saturday night. He replaces Taylor Duryea as the only change to the team that thumped Fremantle by 72 points in Launceston. The Swans lost ruckman Mike Pyke to a knee injury and defender Jeremy Laidler to an ankle injury for the grand final re-match. Sydney made a total of four changes with Ted Richards, Craig Bird, Brandon Jack and Toby Nankervis all coming into the side. Former North Melbourne midfielder Levi Greenwood has been named to play his first home-and-away match for Collingwood after finally overcoming the fractured ankle he sustained in the preseason. Marley Williams, Paul Seedsman and Ben Kennedy have also been included in the side to face West Coast. It is not all good news for the Magpies though, with livewire forward Jamie Elliott out with a back injury. The Eagles are in second place on the ladder after their big win over Adelaide and they named an unchanged line-up. Dockers coach Ross Lyon reacted savagely to last week's loss to the Hawks, dropping four players. Paul Duffield and Zac Clarke were among those to make way for Jonathon Griffin, Matt Taberner, Cameron Sutcliffe and Hayden Crozier. Fremantle hosts Carlton on Saturday with the Blues handing Brad Walsh his AFL debut, with Sam Docherty and Sam Rowe also earning call-ups. Geelong has lost defender Jared Rivers to a knee injury on top of the suspension handed to skipper Joel Selwood. The Cats recalled Shane Kersten, Mitch Duncan and Jake Kolodjashnij for their encounter with the Western Bulldogs, who regain Jordan Roughead and recall former Bomber Stewart Crameri after a spell in the VFL. Ruckman Will Minson is out with a shoulder injury and Michael Talia has been dropped. Gold Coast and Greater Western Sydney were both dealt injury blows ahead of their clash, with Seb Tape (hamstring), Charlie Dixon (ankle) and David Swallow (knee) out for the Suns and Dylan Shiel (knee) unavailable for the Giants. In significant team news for Sunday's matches, St Kilda has named Nick Riewoldt for its clash against Richmond. The fixture will serve as a fundraiser after the sad passing of Riewoldt's sister, Maddie, from a rare bone marrow disorder. But the Saints skipper is battling a calf injury and must prove his fitness in order to play. The Tigers regain ruckman Ivan Maric from suspension but lose Shane Edwards to a leg injury. Adelaide has included forgotten key forward James Podsiadly in an extended squad for the Showdown with Port Adelaide, for which it has dropped former skipper Nathan van Berlo. Jasper Pittard is out for the Power with an ankle injury. Stefan Martin returns from suspension for Brisbane, who takes on Melbourne at the MCG. The Demons have included former captain Jack Grimes and ruckman Mark Jamar. The round bounces down on Friday night when the Kangaroos take on Essendon at Docklands. Kangaroos forward Aaron Black is in for the suspended Drew Petrie, while Kyle Langford replaces Alex Browne, who was concussed in a heavy tackle in the Bombers' tight win over Melbourne.